Applications dictate IT architecture, and evolving requirements have resulted in an ever-changing relationship among servers, storage systems, and network fabrics. Although virtualized environments and first-generation hyperconverged systems solve some problems, they also create new infrastructure silos, fail to deliver massive scalability, and lack lifecycle management features and strong data security. The Cisco HyperFlex HX Data Platform revolutionizes data storage for hyperconverged infrastructure deployments. The platform’s architecture and software-defined storage approach gives you a purpose-built, high-performance distributed file system with a wide array of enterprise-class data management services. The data platform’s innovations redefine distributed storage technology, providing you with the next generation of hyperconverged infrastructure. 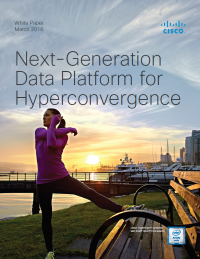 Download this white paper as it describes Cisco HyperFlex HX Data Platform Software, which revolutionizes data storage for hyperconverged infrastructure deployments. You’ll learn about the platform’s architecture and software-defined storage approach, and how you can use it to eliminate the storage silos that complicate your IT infrastructure. As thank you for downloading, we will enter your name into a draw to win a pair of VIP tickets for the final round of the RBC Canadian Open July 23-24 at the Glen Abbey Golf Club in Oakville, Ontario. Deadline to enter is May 18.